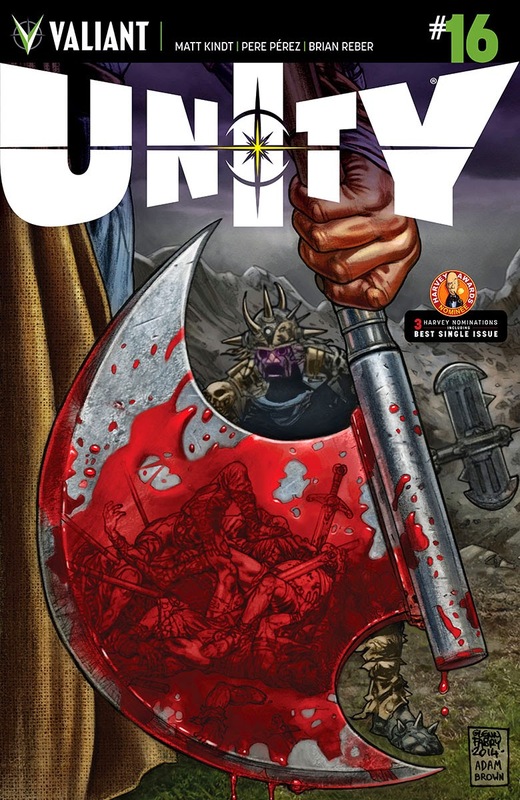 The Fellowship was fortunate enough to obtain a copy of UNITY #16 from Valiant Entertainment. The story is written by Matt Kindt, art by Pere Perez, colored by Brian Reber, and lettered by Dave Sharpe. After a brutal battle, Gilad the Eternal Warrior takes some time away from the Unity team to recover. He travels to Tokyo to recover…and to recollect. Gilad flashbacks to his visit to Feudal Japan, his attempt to save a town from an invading force, and a female warrior. We come back to present day as he continues a ritual started so long ago – to ensure that a certain story (and woman) is never forgotten. I’ve said before that I think Gilad is my favorite character of the Valiant Universe, and if I have to defend that position I would present this issue as exhibit A. He is an extremely complex man who appreciates even the most simplest of things. Kindt crafts a great character study that has action, but never to the detriment of the story. The team up of Perez and Reber is incredible; every page is beautiful…even the violent ones. Another winner from Valiant Comics! UNITY #16 is in stores now, or available for ordering at www.valiantentertainment.com.